Eyebrows: Among the many potential functions of eyebrows, they keep sweat and moisture from dripping into our eyes, send information about local conditions to the nervous system via the hair follicles, detect the presence of dangerous microbes, help us convey emotion, and act as landmarks to help us identify other faces. Eyelashes: On mammals with eyelashes, the extensions are always one-third of the eye’s width, on average. Why? Based on wind tunnel experiments, researchers believe our aerodynamic lashes help minimise airflow across the eye’s surface, thereby protecting it from blowing dust and evaporation of the tear film. Eyelids: Each eyelid pair contains roughly 60 meibomian glands, with slightly more in the upper lid than in the lower lid. With every blink, these glands pump out droplets of oil that coat the eye’s surface to prevent tear evaporation. Blinking: The average person blinks about 16,800 times every day. Based on observations with high-speed cameras, a blink of an eye takes a bit longer than previously thought: spontaneous blinks take about a third of a second and voluntary blinks last half a second. The cornea: The transparent cornea is the only body tissue with no blood vessels (which would interfere with sight). 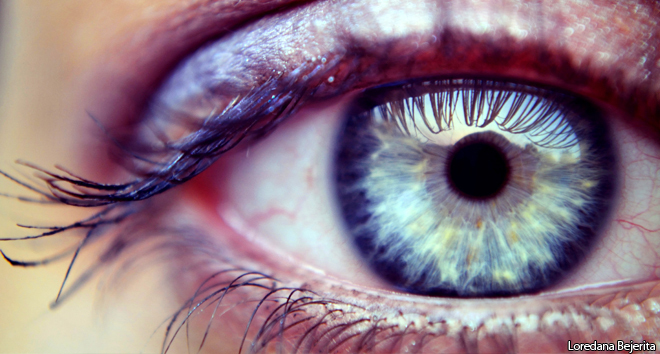 Researchers believe the cornea holds the highest concentration of nerve endings on the body’s surface, however, which explains why eye pain can be so intense. In fact, injury to a single cell on the corneal surface may be enough to trigger pain. Corneal sensitivity: Doctors use a device called an esthesiometer to measure corneal sensitivity; the first one, built in 1894, was made of horsehair. Materials from other animals have helped us even more: shark corneas are similar enough to our own that scientists have long studied their anatomy and physiology. Because shark corneas also resist swelling and thus remain transparent under a variety of conditions, eye surgeons have successfully transplanted them into both humans and dogs. Tears: The chemical composition of our tears changes depending on why we’re crying. The Topology of Tears project by photographer Rose-Lynn Fisher includes magnified photographs of 100 tears triggered by a range of causes, from grief to onions. All are secreted by the lacrimal glands above the eyes and fall into three groups:· Basal tears act as everyday lubricants and moisturisers and contain the antibacterial proteins lysozyme and lactoferrin.· Reflex tears rain down in response to pain or irritation, like bright lights or tear gas. Their composition is similar to that of basal tears but has higher concentrations of lysozyme, lactoferrin and other ingredients.· Emotional or psychic tears flow in response to emotion and can vary in their composition depending on whether we’re happy or sad. Tears of sorrow, for example, contain stress-related hormones and a natural morphine-like painkiller. Goblet cells: Shaped like champagne flutes, these cells are scattered throughout the white part of the eye and the lining of the eyelid where they secrete the major ingredient of mucus (we also have these cells in our gut). This sticky mucus, in turn, acts as the base to which tears can adhere and spread out evenly. What causes what they call Lazy Eye, which I had but was not caught soon enough which resulted in an eye rate of 20/800 (I was born in 1944 and they did not have eye testing like they have now)! Like me am right eyed and brained.